CHARLOTTE, N.C. -- Ted Ginn Jr. is proving coach Ron Rivera is right - he can still blow the top off a defense. 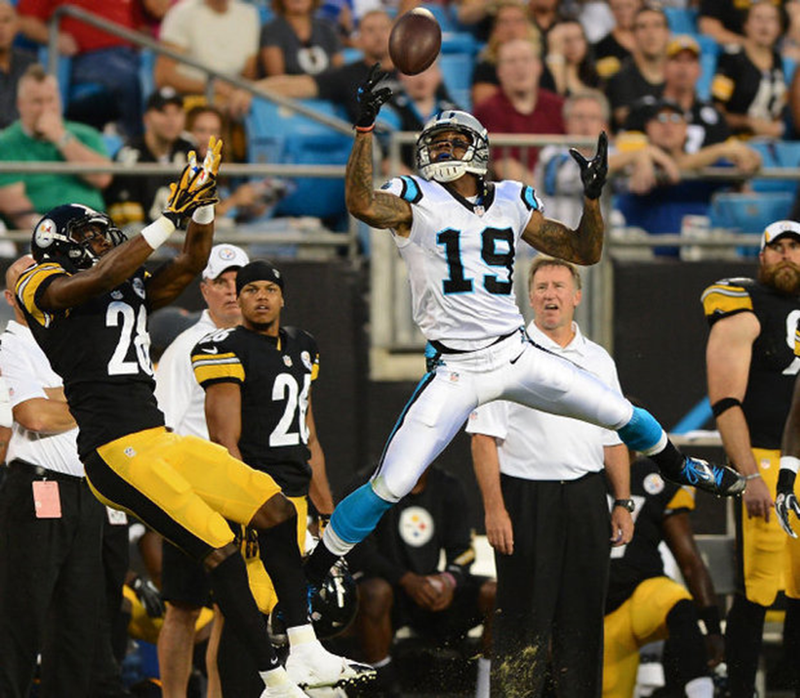 The 28-year-old Ginn is earning himself a home in Carolina, catching five passes for 149 yards and two touchdowns to lift the Panthers to a 25-10 preseason win over the Pittsburgh Steelers on Thursday night. In a game devoid of star power, Derek Anderson completed 10 of 15 passes for 220 yards, including TD strikes of 87 and 35 yards to Ginn, who is looking to re-establish himself in the league after being run out of Miami and San Francisco. "It was great just going out and finishing the preseason with a bang," said Ginn, whose 74-yard punt return sparked Carolina's 34-27 win over Baltimore last week. "I'm happy I was able to show my team what I have." Only a handful of starters played as both coaches took a long look at players further down the depth chart. Rookie quarterback Landry Jones started and played the entire game for the Steelers, completing 16 of 35 passes for 189 yards with one touchdown and three interceptions. After throwing a 13-yard touchdown pass to tight end David Paulson on Pittsburgh's opening drive, Jones couldn't get the Steelers back in the end zone on their next 13 possessions. Jones admitted he made "some really bad decisions." "It was just errant throws - it happens," Jones said. The Steelers drafted Jones in the fourth round giving them another option at quarterback for the often-injured Roethlisberger. He did well avoiding the pass rush he seemed to struggle as the game progressed throwing three second-half interceptions, including one in the red zone. His best play came in the second quarter when he escaped a pass rush and threaded the needle by hitting Derek Moye on the run with a 32-yard completion. "I just wanted to go out there and play to the best of my abilities, and obviously, I didn't do that tonight," Jones said. "There's a lot of football (game film) out there to watch, and I've got all day tomorrow to get it done." The Steelers' starting offensive line played for two series, but all of their primary skill players were given the night off, including Ben Roethlisberger, Isaac Redman and Antonio Brown. The Panthers rested almost their entire starting offense, as well, including Cam Newton. The only big play Newton made all night was wearing a bold pair of neon-green sneakers that stood out like a beacon on Carolina's sidelines. Rivera rested Newton and company despite the fact Carolina's first-team offense had only scored one offensive touchdown in the preseason. Earlier in the week Rivera scoffed at the idea the Panthers offense had "struggled" in the preseason, instead saying he liked the way the team was moving the ball "but we just need to put the ball in the end zone." Anderson did that twice in the first half, including finding Ginn on a seam route for a 35-yard touchdown pass on the game's opening drive. Ginn then raced by Pittsburgh's DaMon Cromartie-Smith and Curtis Brown for an 87-yard touchdown catch. "I came out and saw the safety take a bad angle right away and Ted's so fast that I just gave him a chance," Anderson said. "I don't think you can actually overthrow him." After placing Jonathan Stewart on the physically unable to perform list earlier this week, the Panthers went into the game looking for a potential backup for DeAngelo Williams. Tauren Poole got the start at running back and ran for 32 yards on 10 carries, while Armond Smith had 43 yards on 17 carries. Rivera was pleased with his team's overall play, including the defense which had three turnovers. The Panthers finished the preseason with 13 takeaways in four games. "The thing that showed is we have some good young backups," Rivera said. "We got an opportunity to see those guys play today and they played well against a very physical, very tough Pittsburgh Steelers team." Steelers coach Mike Tomlin was a little more critical of his reserves. "Hopefully, we can separate the guys who don't belong and we can correct that over the next 48 hours," Tomlin said in advance of NFL's looming roster cuts to 53 players on Saturday.